First note: the title of this post is the name of a book by Professor Tim Spector. Just thought I’d get that in quick before anyone throws around accusations of plagiarism! And on that same note, this is a post about a talk I went to at my old university (King’s College London – thanks to KCLA for organising it!) by Prof Spector about that same topic his book is about: epigenetics. 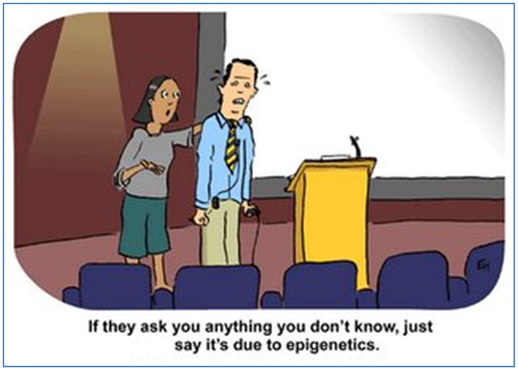 Epigenetics is another biologically defined layer to who we are. It sits ‘above’ the genes so to speak and, similar to regulatory elements, can control the amount a gene is expressed without actually being a genetic code that is itself transcribed. The difference is that epigenetics isn’t a genetic code in the same way our DNA is, it is a layer of other changes to the DNA without changing the actual bases written in our genome. Two key examples of these changes are methylation and histone modification. Both are effectively ‘structural’ changes. It is believed that our ‘epigenetic code’ is heritable (although there is some debate over that of histone modifications) and this is where Prof Spector’s talk focussed it’s attention. Professor Tim Spector works with twins, thousands of them. And what better way to understand heritability of things, stuff, everything to do with who we are! Monozygotic twins have exactly the same DNA but we can tell (once we’ve got past the identical appearances) who is who in a pair through anything from favourite colour to taste in a partner. So how can two people derived from the same egg, the same sperm, the same ‘stuff’ be different? Prof Spector believes that much of this missing heritability lies in our epigenetics. This extra layer of ‘code’ (I’m not keen on calling it code but will use this for now until I think of a better word. It is not code like our DNA is, it is not comprised of bases or chains of molecules) can be affected by our diet, exercise regime and even maternal care. However Prof Spector goes on to suggest that the diet, exercise regime and even maternal care of our parents or even grandparents could affect our epigenetic pattern (possibly a better word?). He also spoke about how our epigenetic pattern (yes a much better word) could be altered, reversed or added to. Surely epigenetics is therefore transient? I therefore feel slightly uneasy at the idea that nurture could alter what we think of as nature in the great debate of who we are and how we become ourselves if it isn’t permanent however Prof Spector put forward some good valid points about family patterns of inheritance not found in the genes. One thing that has certainly been shown is that our epigenetics do change over time, with MZ twins diverging from one another, a reasonable explanation for differences in identical twins as they get older (1). This leaves me with two questions really, how much of this missing heritability can we attribute to epigenetics? I don’t want to blame my grandparents’ generation for our current obesity epidemic just yet…! and secondly, a question that I’ll have to just read into more probably, could it be possible for epigenetic changes to cause subtle permanent changes to our genome in a way we don’t yet understand and cause a whole new way of creating variation within the population? Just speculation for now, I’ll have a read round and see what I can find but a layer of information on top of the genome (although limited to the possible information within it) surely has plenty of potential? 1) Fraga, Mario F., et al. “Epigenetic differences arise during the lifetime of monozygotic twins.” Proceedings of the National Academy of Sciences of the United States of America 102.30 (2005): 10604-10609. Information about Professor Tim Spector’s book is found here.